The message, posted on New Year’s Eve, was accompanied by a video showing a B-2 bomber dropping weapons. Strategic Command later deleted the tweet, saying it was “in poor taste”, and replaced it with an apology. The incident sparked outrage online. It was posted online hours before the annual “ball drop” on top of One Times Square, a New York skyscraper, which marks the start of the new year. The tradition began in 1907, and sees a brightly-lit ball on a special flagpole descend 43m (141ft) in the 60 seconds before midnight, coming to rest as the new year begins. Critics were quick to condemn Strategic Command’s take on the event. 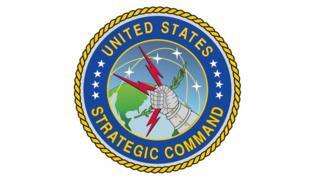 US Strategic Command is one of 10 unified commands in the US Department of Defense. It is based at Offutt Air Force Base in Nebraska. The command slogan is “Peace is Our Profession”, which was also used in hashtag form in the controversial tweet.